Multiple Grade 1 winner Bolt d'Oro has arrived to B. Wayne Hughes' Spendthrift Farm to begin his transition from racehorse to stallion, Ned Toffey, the farm's general manager, confirmed Wednesday. He will stand for $25,000 in 2019. The son of Medaglia d'Oro made his last start in the June 9 Metropolitan Handicap (G1). Since then, owner Mick Ruis transferred the colt from his own care to trainer Steve Asmussen. Bolt d'Oro last worked out on Oct. 17 toward a potential start in the Clark Handicap (G1) before retired. “He had a workout, a very nice workout," Toffey said, "and he just came out of that a little bit sore, so we decided to go ahead and stop on him." Since arriving to Spendthrift, in Lexington, Ky., Bolt d'Oro has adjusted "beautifully." 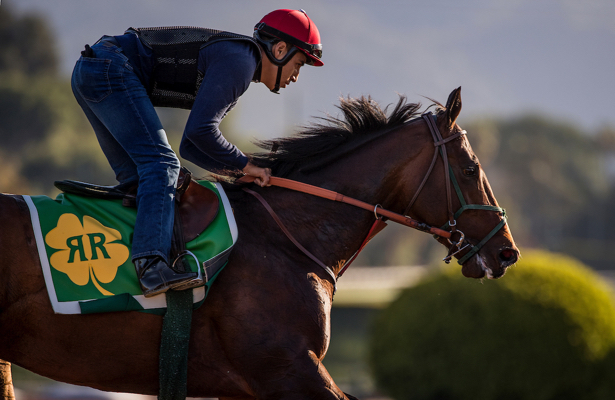 The only 2-year-old colt of 2017 to win multiple Grade 1 races, Bolt d'Oro emerged as a Kentucky Derby contender with back-to-back wins in the Del Mar Futurity (G1) and FrontRunner Stakes (G1). At age 3, he battled McKinzie and was placed first by stewards in the San Felipe (G2) before finishing second to Justify in the Santa Anita Derby (G1). Bolt d'Oro didn't take to the sloppy track on Kentucky Derby day, running 12th at Churchill Downs. “When you see this horse, one of the remarkable things about him is he’s a big athletic horse, but 2-year-old form wouldn’t necessarily be the first thing that comes to mind," Toffey said. "Yet that’s exactly what he demonstrated, was tremendous ability right from the start. Our feeling is that is a really good indication, that’s there’s just tremendous innate ability. A $630,000 yearling purchase, the colt finished his career with a record of 8: 4-1-1 with earnings of $1,016,000. Bolt d'Oro is one of three new stallions at Spendthrift for 2019 along with Mor Spirit and Free Drop Billy. “We feel very fortunate to have gotten him and we’re very appreciative to Mick Ruis to have worked with us on this horse," Toffey said. "I think this is a horse that essentially every major stud farm in Kentucky was very, very eager to stand. He’s a son of a stallion whose stud fee is ($200,000) who’s proven one of the most successful international stallions in the world, Medaglia d’Oro."